Welcome to Part 2 of our duty cycle journey. 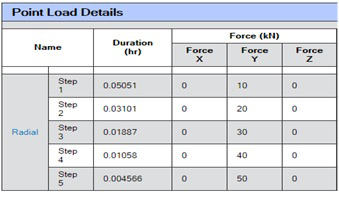 In the first part, we reviewed how to take a duty cycle or one block of a duty cycle and reduce it to a single torque and calculate the cycles required to have the same amount of fatigue damage. Since speed isn’t directly part of the basic bearing load equation, that can be left to your discretion. A note of caution — speed is not irrelevant in reality where oil viscosity and film play a role. If you are calculating aiso values, there are some tricks to figure out if you your reduction is too aggressive — which we will briefly discuss. Figure 1: Equivalent Duty Cycles. 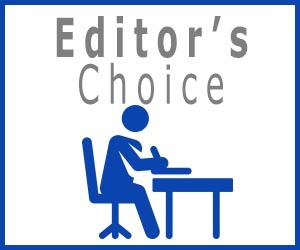 Always being diligent in our work, we need to prove that these are in fact equivalent. Generating a quick model (Fig. 2), we input 2 different duty cycles — the full duty cycle (Fig. 3) and the reduced duty cycle. Figure 2: Test Model for Duty Cycles. Figure 4: Reduced Duty Cycle. You see that we have different durations that result in the exact same bearing damage for both cases. Just a couple points for clarity before we move on. You may have noticed I used point loads for my duty cycle. Since I didn’t have an easy gear mesh on hand, I just applied the loads directly to the bearings. As mentioned before, the units do not matter if you stay consistent. This works for torque or load. Savvy readers might note that our duration increased a little for our reduced duty cycle. Remember there are several uses for a reduction. If you want to reduce actual time, just bump up your bin torque a little to reduce the time. 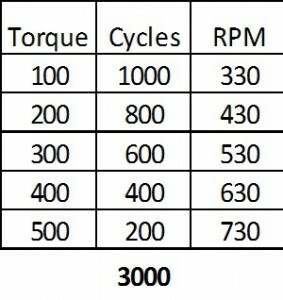 For example, if you bump the torque to 350 NM, your cycle count drops to 1,731. If the purpose is for ease of calculation, this works just fine as is. There is also an important lesson here; I have seen more than once where someone has tried to reduce a block just by taking a straight average torque and adding the cycles. In this example, you would have only calculated your 250 NM torque to 3,000 cycles instead of 4,749, underestimating your damage by nearly 40%. There may be certain situations where torque is not your primary concern. 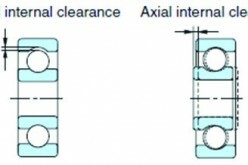 If you are testing switches, hydraulic circuits, actuators, seals and other non-load bearing components, you may want to keep the original cycle count while adjusting your torque. Figure 5: Sample Duty Cycle. Let’s revisit our favorite pretend duty cycle in Figure 5. Now we are going to keep the original cycle count in the duty cycle and calculate the torque needed to maintain equivalent damage. Since we are getting the hang of this, let’s skip the L10 and Damage calculation crutches and jump right to the general formula. We will use damage to double check our work, but we don’t need it as a placeholder in the meantime. In this method, we also want equivalent damage, so we really just need a method of weight averaging the torque for the bin. We must be careful about averaging when exponents are involved, and here is how we do it. Let’s revisit our favorite pretend duty cycle in Figure 5. Now we are going to keep the original cycle count in the duty cycle and calculate the torque needed to maintain equivalent damage. Since we are getting the hang of this, let’s skip the L10 and Damage calculation crutches and jump right to the general formula. We will use damage to double check our work, but we don’t need it as a placeholder in the meantime. In this method, we also want equivalent damage, so we really just need a method of weight averaging the torque for the bin. We must be careful about averaging when exponents are involved, and here is how we do it. 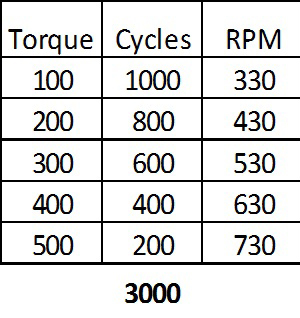 Figure 6: Calculating Weighted Average Torque. Now we are stating that we can keep our original 3,000 cycle count and evaluate at a single torque of 291 NM. Now we are making some pretty serious claims by stating these 3 duty cycles are equivalent. Can we prove this nonsense? Of course, we can, and you should, every-single-time you do this. Figure 3: Full Duty Cycle (top). Figure 4: Reduced Duty Cycle (bottom). 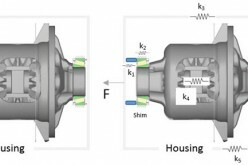 Figure 7: Weighted Torque Method. And there you have 3 different duty cycles with the exact same bearing damage, each having its own purpose. 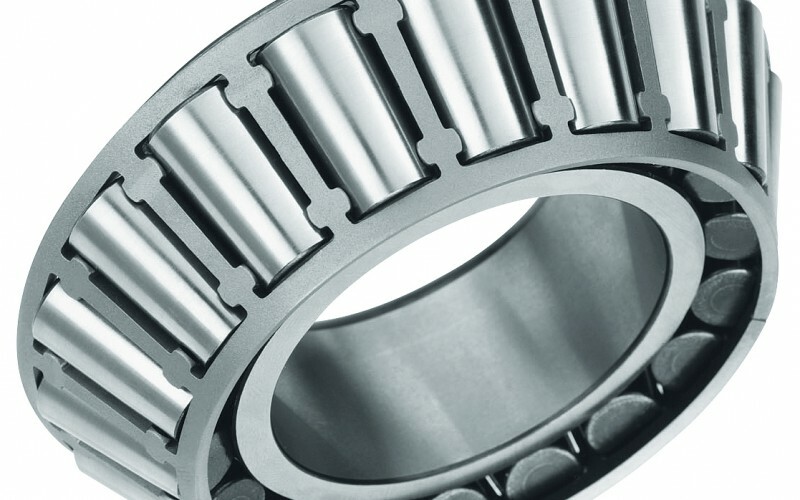 This technique is not limited to bearings. 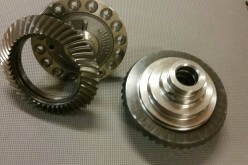 Gear designers must evaluate duty cycles all the time and I have won over more than one gear expert with these simple methods. All you need to do is change your beta from 3 to the gear beta from your SN curve. With these two techniques, you have the tools to spin this off is any number of directions. If you want a 100 hour duty cycle, you can adjust your rpm’s to an extent, but now you know how to adjust your cycles if rpm’s alone can’t get you there. If someone wants an entire duty cycle broken down by 500 NM increments, you just bin out your duty cycle at every 500 NM and torque ratio those bins into a single torque. I mentioned a trick to figure out if you reduced your duty cycle too far. What I mean by this is that it’s obvious that this method obviously has limitations. 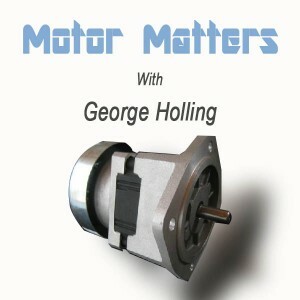 You can’t test a transmission for 1hr at 20,000 NM output torque because the damage balances. 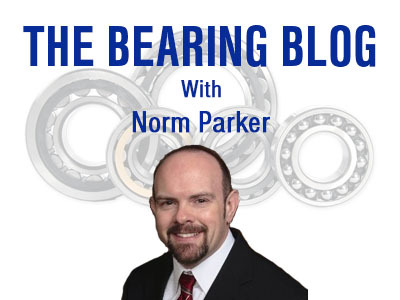 If you don’t have bearing software, an easy choice for the torque ratio method is just to take the average torque in each bin (for 0-500 NM, pick 250 NM) and calculate the cycles accordingly. If you have bearing software, compare your aiso values for 281:2007 between the original and the reduced duty cycles. If the aiso value of the reduced duty cycle drops by more than 20% or so, you are going too far and may start to experience surface failures. If your aiso increases, you can certainly reduce further. I have tried taking the 90th percentile torque for each bin to set my torque ratio to and it just winds up being too aggressive. For instance, if I use 400 NM in my 0-500 NM bin, my aiso drops dramatically – it’s too aggressive. Just by comparing aiso values, I usually wind up around the 50th percentile mark anyway. I hope this was a worthwhile exercise. This can be a little confusing until you get the hang of it. Shoot me any questions in the comment section or if you need help setting up your spreadsheet, I can probably get you on the right path.